The Tucker Double Pedestal Desk with Leather Insert Top by Coaster at Carolina Direct in the Greenville, Spartanburg, Anderson, Upstate, Simpsonville, Clemson, SC area. Product availability may vary. Contact us for the most current availability on this product. 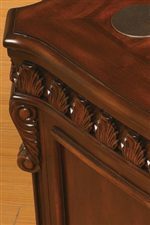 800800B1 Desk Box 1 1 0" 0" 0"
800800B2 Desk Box 2 1 0" 0" 0"
Finish & Paint Options Rich Brown medium wood finish. Handles & Hardware Antique style metal bail handles. Case Detail Classic molding, fluted columns, acanthus carved trim. Drawer / Shelf Construction Felt lined top drawers. Wire Management Power strip featured on hutch, and wire management holes in desks. Description: Top Smooth tops with molded edges. The Tucker collection is a great option if you are looking for Traditional furniture in the Greenville, Spartanburg, Anderson, Upstate, Simpsonville, Clemson, SC area. 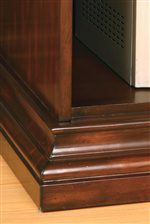 Browse other items in the Tucker collection from Carolina Direct in the Greenville, Spartanburg, Anderson, Upstate, Simpsonville, Clemson, SC area.